Before we could head anywhere today we had to collect our next guest - Judi and I met in the early 1970's when we were both in the WRAF together. Monty had to accept what passed for a walk, unfortunately the walking round here is all on roads, so not great. Judi arrived laden with goodies - a lemon sponge, some almond fingers and something we had never come across despite living in Lincolnshire several years - Lincolnshire plum cake. The sponge is delicious - the other two are waiting to be tried, possibly when we cross the Wash. I have to say that the journey was not that interesting, but it was just great to have a chance to catch up with another friend. The sun shone which made the wind bearable. Langrick Bridge was the first point of any interest. she did go in! She is somewhere under the splash closely supervised by Mum on the bank. Then at last Boston hove into view - St Botolph's Church is visible for what seems like miles. for which we were joined by Judi's sister, Sue, and her husband, Mel, who had come to chauffeur Judi back to her car. It was good to catch up with them all again. We then decided we would be better nearer to the water point and bow in to make filling the tank easier, so off Chris went whilst I waited on the pontoon to catch a rope. Monty was not happy - he thought they were leaving me behind! Safely moored and the 'flock' reunited. So now all that had to be done was to play the 'Waiting Game' until we could cross The Wash. Thursday was the appointed day. Cleddau and crew arrived on Tuesday and we all have everything crossed that we are good to go. So what was there to do in the meantime? We had visited St Botolph's, the War Memorial and got close to Maud Foster Windmill four years ago - if you want to see details please look HERE. Well jobs had to be done and Monty needed exercise. I certainly spent a lot of time along the river bank and in Witham Way Country Park, which, although not extensive is worth a visit as there is a lot to look at and admire. More information can be found HERE. There are many notice boards with information about the flora and fauna. 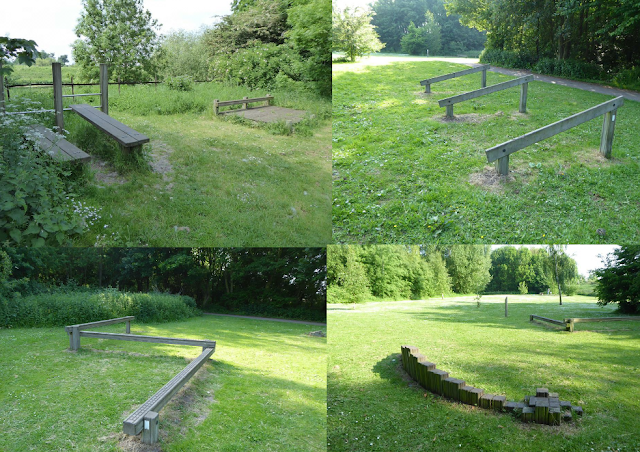 There is a trim trail with several structures aimed at keeping one fit. Most were beyond me, but Sue and I did manage the one on the bottom right and the lowest balance beam, bottom left. I have to say that I never saw anyone using any of them despite going past a good number of times over the four days we were in Boston. There is a Jubilee Community Orchard opened in 2012 with two varieties of apple trees and two different plums - all available for anyone to help themselves. There is one enclosed picnic area where, quite rightly, dogs are not allowed access. There are other open spaces to enjoy - ideal for ball games. There are benches to shelter from the sun or rain -or maybe to collapse onto after a work out on the bars in the background! There are many black bags around that, I have to say, seem to have had the desired effect as there was very little litter. One regular dog walker told me that there are never any dog wardens in this area, so there is little point in having such notices. It is a sad reflection on society that there should ever be a need for such notices. We did pop into town a couple of times. On Tuesday we stumbled across this building which looked completely out of place in a suburban street of very ordinary buildings. We gathered from a passing pedestrian that it is still used by the Masons. The Grand Sluice (that we will go through on Thursday) is worth a mention. It was completed in 1766 to prevent the tides surging upstream. The river was straightened (the sandy coloured course below shows the original river) and made deep enough for boats to navigate, Construction began in 1764 in what was then the middle of a field and the river was then diverted through it. The River Witham flows for 82 miles in a great loop through Lincolnshire. It rises on the border of Rutland and flows through Grantham and Lincoln before it reaches Boston. This was not here when we last visited in 2014. Take a look at the downstairs windows on these houses - the two on the right open at the top, but the one on the left opens at the bottom. There are two other bottom opening ones at the far end. The windows are identical which led us to wonder if the bottom opening ones were put in upside down in error? They surely cannot be as secure as top opening windows? Then the next block seems to have some windows bricked up - did they run out of money, was it a design fault or is it deliberate? Sue reckons it has been done to reflect the history of the town and is an example of the days of window taxes. It would be interesting to see inside a house and whether a window would have been useful. And then there is, of course, St Botolph's or The Stump. It dominates the town and is certainly worth a visit. I did wander in briefly as I had heard word about a project to build a replica of the church with lego. It is a fund raising effort with the bricks being £1 each. I do apoligise for the poor quality of the photo - I must have had a wobble, but you can get the idea of just how big a task they have set themselves. Full details can be found HERE. It looks as though it started on 16th August 2016. The information in the link says they are expecting it to take 3 years - it looks as though they still have a long way to go. I purchased my bricks from the shop as instructed and took my slip back to the 'builders' who provided me with five window bricks which almost completed the last window in this section. I could not resist this little church mouse - also being sold to raise funds - this time for the homeless. I have been reliably informed he is turbo charged as the ears and tail are made from leather from an old Rolls Royce seat that someone donated. So did we miss anything - sadly yes - the live feed from the nest containing four peregrine falcon chicks. The monitor is in St Botolph's church coffee shop. I am hoping by the time this is published tomorrow (Thursday) we will be nearer Kings Lynn than Boston. Totals to date this trip - 204 miles, 148 locks. It was not the best start to the day as we noticed a lady with three dogs walking along the Water Rail Way holding a pigeon by its legs and the poor thing was still flapping. By the time I went out to go to the Co op she had left it on the grass verge and it was still breathing and twitching. I know I should have been able to wring its neck, but I am afraid I couldn't. Thankfully shortly after I left Chris went out with Monty and met three guys who (in Chris's words) looked like part of the 'hunting/shooting/fishing set' and one of them had the know how of how to do the necessary and put the poor thing out of its misery. He confirmed it had been hit by a sparrowhawk. I know pigeons are vermin, but I still cannot bear to see anything suffering. With an understandably secure door. The guns mentioned above appear to be shotguns for clay pigeon shooting. Past the redundant sugar beet processing factory which really was huge. It was first proposed in 1925 and the Lincolnshire Beet Sugar Company Ltd was registered as a Public Company on 14th January 1927. Its closure was announced on 23rd January 2001. Images of what it used to look like can be seen HERE. Work begun by Ryvita to build a baking and distribution operation in March 2017. The information I found (see HERE for an artists impression of the new site) said it should be operational in Spring 2018. Signs of new buildings can be seen when you look back at the site. For around 1.5 hours there were no moving boats when suddenly round the corner came this lot! Just like London buses - none for ages and then three together. On we went past the moorings at Kirkstead Bridge for Woodhall Spa - it was a good job we had not planned to stop - there were 5 cruisers and 1 narrow boat - all nose to tail. Tattershall bridge was our target for the day and thankfully the moorings were empty. The mooring is relatively quiet, but it is not great for Monty as there is nowhere safe for him to walk on either side of the river - it is a good job he had a good walk this morning and we will be off again tomorrow. We are meeting a friend here tomorrow, so geographically it is good. There is one other 'pro' to this mooring - RAF Conningsby is nearby and we spotted a Hurricane, a Spitfire and the only one I managed to capture - a Dakota during the afternoon. We spotted this just after 4pm, too late yet again (! ), but it did explain the beat Chris thought he had heard on the wind. Locked in the Pub - 7 May! !